Appearance: Dark copper with thin legs and a lot of necklacing. Nose: Sweet peanut butter, lavender, alcohol, cut grass. Palate: Caramel, toffee, alcohol, milk chocolate. Finish: Dry and herbaceous with a touch of toffee. Parting words: Costco’s Kirkland brand has appeared on everything from bottled water to dog food and beyond, including booze. There’s Kirkland beer, wine, vodka, rum, tequila, bourbon, Canadian whisky and even a 40 year old single malt Scotch distilled by Glenlivet. All are good values but the bourbon is a standout. On paper, it’s hard to do better. Where else can one get a liter of 103 proof, 7 y/o bourbon for around $20? Nowhere, unless you have a time machine. It’s almost as good in the glass as it is on paper. The label’s statement that it was distilled and bottled by a company with facilities in Clermont & Frankfort, Kentucky reveals that this is a Jim Beam product. The Beam product that is closest to this is the 7 y/o, 107 proof Baker’s bourbon, a sleeper bourbon if there ever was one. While this is similar, it’s a bit milder (4 proof points will do that) but the lower price more than makes up for that. Kirkland is a little harsh at first pour, but opens up beautifully the longer it sits, bringing out chocolate-covered toffee. I’m a sucker for a cheap, high proof bourbon in the 6-10 year range. The 6 y/o Very Old Barton Bottled-in-Bond is about the only one that tops this in that category. 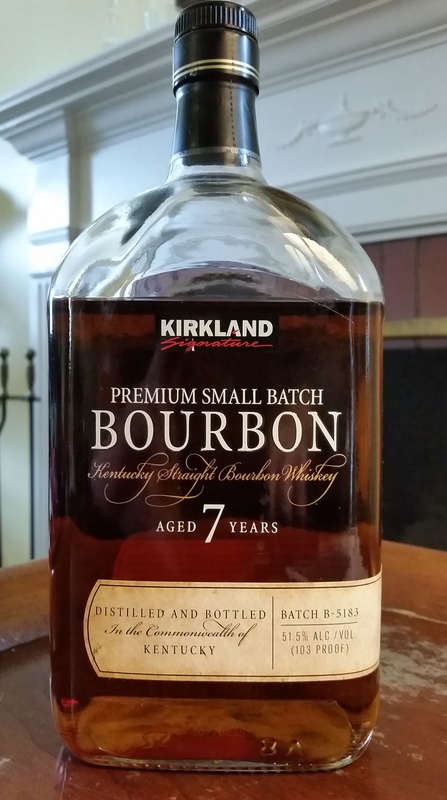 Kirkland Premium Small Batch is highly recommended. VOB 6YO edges out Kirkland but is now NAS. I still like it but I fear that the profile may drift as time passes.. I had some Baker’s last night and love its rich, creamy mouth feel. Can’t afford to drink it every day. That’s why I currently have three liters of Kirkland’s. It’s a treat that I can indulge in regularly. I completely agree. I just wish it was available in the mitten! It’s a great buy if you can get past the smell of Beam’s yeast strain, which I can’t. Fair enough. I don’t mind, obviously!